any trade partner who called the TIRUN offices was guaranteed to win surprise gifts. Following this the company has launched yet another innovative campaign only for their esteemed travel partners – Surprise visits with an offer of illustrating live Caricatures of staff members! 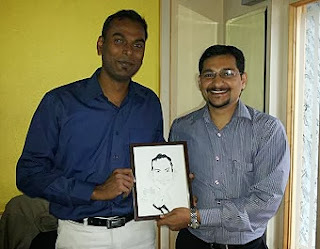 Over the past few weeks, TIRUN team members have been visiting their various travel partners pan-India and gifting them with a caricature of their key staff, purely as gesture of their gratitude and as a token of their appreciation for their partners, some of whom they have been working with for two decades. As a leading travel marketing representation company, with over two decades of expertise within the Indian market, TIRUN has been consistently designing such marketing initiatives with exquisite elements of innovation in each campaign.